DATA modules are now available, and with new hi-res front panels in WHITE and BLACK! They go quick, so order now in the Mordax Shop (with FREE U.S. domestic shipping) or from one of our awesome retail partners. Check out the new look! We changed up the design a bit to be in line with the GXN's panel style; left-justified the DATA at the top and added the little descriptor text. And we finally made the much requested BLACK version! The new panels are FR-4 based, similar to those of many fellow eurorack makers (e.g., Make Noise, 4ms), but these are a little different, using a novel process of stacked layers of liquid photo imaged polymer mask, each a different color - white, black, and green - to make all of the graphic elements. The imaging process is similar to that which actually makes silk screens, but in this case the photo result is used directly in the final product and there's no loss in resolution, compared to running screens, which pass ink through a mesh. The new process gives super crisp, high resolution text and graphics, with perfect alignment, and improved durability compared to our previous screened ink panels. It took quite the effort to develop and manufacture these, but in the end it was worth it; we love how these turned out and we hope you will too! Gotta give a shout out to super brain Bunnie Huang for setting us on this development path. At the Teardown Conference in Portland last May, Bunnie had told us about using layered mask as a potential solution to avoiding the issues inherent with silk screening. Thanks for the tip Bunnie, it totally worked! The front panel change wasn't just for aesthetics though, and it wasn't for cost savings either - the new panels surprisingly turned out to be more expensive! Rather, it was part of a larger directive here at Mordax to identify and address all of the major pain points with our internal and external manufacturing, so that the DATA can be less unobtanium going forward, and so that we can go into production with the other awesome products in the pipeline without getting bogged down. Historically the display/window/panel mount was one of these pain points for our in-house assembly, as well as for service repairs. It was a permanent process, where the window was glued with structural adhesive into the front panel, let sit for 12-24 hrs to dry, and then the display was hand aligned on to the panel with camera assist, UV-cure glued to set the placement, and then silicone sealed to the window/front panel around its edge, with another 24 hour cycle as the silicone set. Now with the new processes there's no permanent adhesives involved between the display, window, and front panel; a die-cut Rogers PORON gasket around the rim of the display compresses to seal the space between the display and window from dust and debris, while holding the window in place against the front panel. The display is mounted to the DATA’s front PCB now, with hex standoffs, on a custom platform (also made of FR-4), which is self-aligning and further aided in assembly by a 3D printed jig. The precision and repeatability in the manufacturing of the new panels was essential, as the powder coating on the former panels could not meet the sub-millimeter tolerances required of the the new display/window assembly design. This improved display/window/front panel process has worked out great for us this run, but we want to point out that it means the new front panels are not compatible with DATAs made using the previous permanent display/window/panel process. So don't go through the trouble of unscrewing all those jack nuts hoping to swap front panels with your mate’s DATA from a previous run. Also FYI - we're not selling the new front panels separately at this time. And speaking of compatibility, we also want to point out that these new DATAs are 100% electrically identical to the previous units, they run the same firmware, and both will work with all future firmware updates. These are NOT the DATA Mk II, there is only one DATA, there’s just different faces and assembly now. There was another revision of the circuit board for this run, adding the mount points, and you can see some parts on the board have moved a little (like the inter-board headers), but these changes are all mechanical. We've already had some folks ask about this and hopefully this clears up any potential confusion, but if not, feel free to email us with any questions you have about the changes. We'll be wrapping production and continuing shipping over the next couple weeks, then we'll be starting right up again on the next batch, as well as doing a test run of a third DATA panel variant - that's right, we're gonna do a silver one too, as we’ve had number of requests from the all-silver-case purists. On the development side, we've got a DATA firmware update in the works, and we're continuing design on the GXN Granular Synthesis System. Obviously we didn't hit our initial target of getting the GXN into production this year, but it's coming along, slow and steady, after a brief pause for all the DFM work on the DATA and processes. We get many emails asking about the GXN's release (just got another one while writing this post actually), which is a good thing, as it means people are as excited about it as we are! But it's hard to gauge its time line with precision; sometimes what you expect to be difficult and take a lot of time turns out to be quick and easy, and then the things you weren't worried about, or things you didn't even know to be worried about, can end up taking forever (like all the contract manufacturing issues we had on this last DATA run!) . We only will release a product when we are satisfied with it, and will never rush just to get it out and grab cash. Patience. Know that the GXN is coming and it will be amazing. Lastly, want to mention some shows coming up in the new year. Mordax will be at the new SynthPlex event in Burbank, California March 28-31, and we'll be returning to SuperBooth in Berlin, Germany May 9-11. These sound far off, but time flies, so start making those travel plans, we hope to see you there! GXN at SuperBooth 2018 & more DATAs on the way! Last month we traveled to Berlin for the mother of synth events, SuperBooth 2018, and took along our new module in development, the GXN Granular Synthesis System. It was a great show and we were excited to show the latest on the GXN, which included the beginnings of the CV control system - check out the interview video with DivKid Ben from Superbooth above. We’re now back to working on the GXN here, with the goal of completing the production prototype hardware for the module by the end of this summer. If that goal is met, we will move into production this fall and have the first round of GXNs available before the holidays later this year. The final price won’t be determined until the production prototype is completed and quoted for manufacturing, but we’re still aiming for under $600 USD. To stay in the loop on GXN availability and developments, be sure to sign up for the Mordax Email Newsletter via the form on the sidebar / bottom of this page. More DATAs are on the way! We’re wrapping up production on the latest batch of DATAs here at Mordax HQ and have started shipping our web-store and vendor orders. If you still need a DATA (or are ready for another!) we are taking and shipping orders now from the MORDAX SHOP (with FREE U.S. domestic shipping), and the DATA is currently or soon to be in stock from our list of world-wide retail partners. Also, concurrently with the GXN development, we’re working on some exciting new features for the DATA. We’re aiming to have these updates for the DATA System firmware ready for release later this summer - stay tuned for more! It’s DATA time! We got a fresh batch of DATA modules available in the Mordax shop (now with FREE U.S. domestic shipping) and from our wonderful retail partners worldwide. With the latest DATA firmware SYS V. 01.02.02 we have a major update to the CLOCK OUTPUT program. The new CLOCK core has been completely redesigned, now with 4 channels of independent clock output (upgraded from 2 ch), all with full CV input control over their divide/multiply value and offset. Many new CLOCK divide/multiply values have been added, including fractional div/mults allowing for dotted and triplet note values (e.g., x1.3 = dotted 8th note), and an increased overall range from /48 (12 measures) to x48 (128th note triplets). The Wave Output program also got some “under-the-hood” work on this update. The oscillators have been improved, they are now higher resolution and have less aliasing noise, and the CV input processing has been further optimized allowing for faster and more precise CV modulation of the oscillator’s frequency and amplitude. Production Update & New Team Member! Production is in full swing here at Mordax HQ! The next batch of DATAs is slated to go out to our pre-ordered retail partners by the end of September, with units available to order directly on our website and from additional retailers shortly thereafter. Above is a video of the DATA faceplates being cut from aluminum sheets at our new production partner, Profile Laser, in Portland, Oregon. This is the first time we’ve utilized a fiber laser for faceplate cutting and we’re blown away at how fast and clean the cuts are. Thanks Profile team! The run’s faceplates are all cut and powder coated, and will start coming in from the silkscreen shop later this week. Aside from the current production run, we’ve been working on an update to the DATA firmware which fixes a bug with the Clock program’s larger division values. Fixing this bug lead to a complete re-design of the Clock program’s core, and allowed adding additional independent clock output channels and more div/mult values, including dotted and triplet notes! We hope to have this new firmware update fully tested and ready to go out in the next few weeks to existing DATA users, and we plan to ship all DATAs currently in production with this latest firmware version. Lastly, we’d like to introduce you to the newest member of the Mordax team, our Embedded Systems Design Intern, Blake Rayburn (pictured above). Blake is an undergraduate student in the Electrical and Computer Engineering program at Oregon State University. He’s been working with us over the summer on some exciting new projects (more on those later!) and has been doing a great job learning about embedded audio, video, PCB design, and techno. The Mordax DATA User Guide has been updated to cover the new features in the System Firmware V01.01.00 update! New sections in the manual provide an overview of the Oscilloscope's new XY Scope and Minimal Display mode, as well as instructions and examples for Waveshaping (FOLD & CLIP modes) in the dual Oscillator program. DOWNLOAD THE LATEST DATA USER GUIDE HERE! Whew! We made it, just got to Berlin for the SuperBooth! We’ve been working non-stop for weeks trying to get ready for the show while concurrently producing and shipping hundreds of DATAs, it’s been total madness and we’re very grateful for all our friends who pitched in to make it happen! And at last, we're happy to announce the NEW DATA FIRMWARE is now available for download! The firmware adds the new XY scope and “minimal display mode” to the Oscilloscope Program, adds the Triple Wave Folding mode to the dual Waveform Output Program, as well as adds improved encoder knob handling and many little system wide fixes and optimizations. To access the XY scope and "Minimal Mode" options in the Oscilloscope program, just hold down the Menu Button for 2 seconds (top right most button) and you will see the top menu items change. To get back to the normal top options (CUR-TRIG-TIME), hold the Menu Button again. The new wave folding feature of the Wave Out program can be accessed via the “Modes” pop menu at the top right of the screen; select mode “FOLD” or “CLIP”. Also, for reference you can see these features in use in the video from the NAMM trade show a couple months back. It’s happening! The DATA PCBs arrived at WMD’s facility last week and they made a test run of populating the SMT parts on the boards. They sent us the test units last Saturday and we did the final assembly and inspection over the weekend (big ups to William, Mickey, and the WMD team for their on-point service, as always). Everything checked out and we green-lit the run on Monday. WMD is running the boards on their pick-and-place machine currently and we’re expecting to get our first shipment of populated DATA boards the end of this week or early next week; hope to start shipping out DATAs end of next week! Thanks for being patient everyone, the wait is almost over! First, the face plates were cut with an error in interior hole dimensions, so that the buttons, jacks, etc. didn’t fit through them. Luckily this was caught before powder coating and silk screening the lot of them, and our laser folks acknowledged their error and fixed the issue without additional costs to the run. The face plates have now been re-cut and powder coated, we should be getting them back from the silk screen shop later this week. Second, our circuit board fab in China got backup up during Chinese New Year (really need to start marking this one on the calendar). I just heard from the board house today and they said our order is now 2-3 days from being completed. We ordered boards back in January and they usually take 7-10 days to produce, so this has been a fair amount longer than expected. 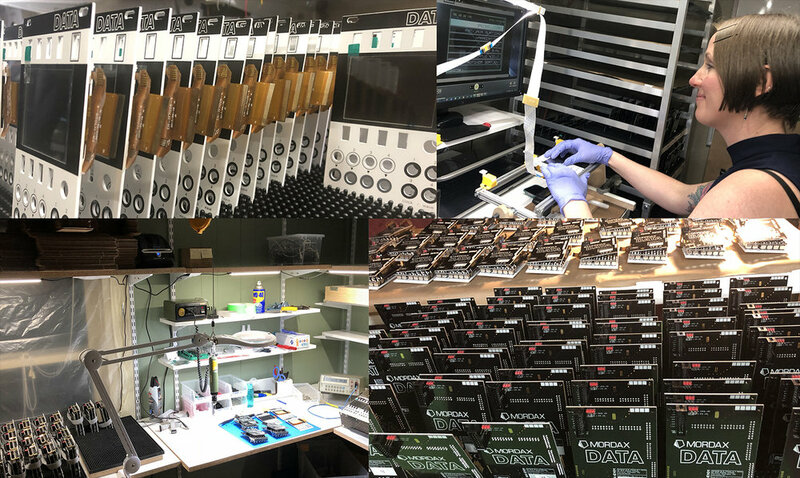 We’ve got all our parts at WMD’s facility in Colorado, so they’re ready to go with populating the SMD as soon as the PCBs arrive. The final assembly on our end for this run is much quicker than the last, since the last board rev required adding a few SMD parts by hand and now those are machine populated. With the PCBs being shipped in the next few days, we should be able to get DATAs out within the next few weeks. As soon as the pre-order units are out we’ll start on filling the retail orders for this run, which we’re still aiming to get out by the end of March. Thanks for being patient, we’ll keep you posted on developments! NAMM 2017 is over! It was a blast, but it's good to now be back in the lab and continuing forward with the DATA's next round of production, the new DATA firmware, and our next products. XY Scope for viewing Lissajous curves, our most requested feature to add! Improved Scope Drawing. We optimized some of the display functions in the scope allowing for even faster and smoother screen updates. Minimal Display Mode for the Scope, turns off the grid and on-screen controls. Wave Folding Mode for the dual Oscillator program. In addition to the Clip waveshaping, there's now an option for Triple Wave Folding the waveforms. We're also working on the encoder handling routines to make the encoder input smoother. The DATA User Guide is here! The wait is over - the first version of the DATA User Guide is now available for your viewing pleasure! We're working on some video tutorials next, so stay tuned for those! And we're also hard at work on new stuff for the DATA's firmware, which includes making the encoder knob a little less sensitive, as well as adding the much-requested XY scope program. We'll be at the NAMM show in Anaheim, CA, on January 19–22, 2017. We're in the big WMD synth block again, Booth 5000 Hall B, stop by and say hello! The DATA 2nd Run Pre-Order is now closed - thank so much to everyone who ordered!!! Production is in full swing now, still shooting for shipping 2nd Run orders February 2017, which is next month - oh my, busy times here at Mordax HQ! And if you didn't get in on this Pre-Order, not to worry, as we've got stock going out to our retail partners (around the world), just as soon as all the 2nd Run Pre-Order units are all out. Our target for retail deliveries is March 2017. Some shops are already taking their own DATA Pre-Orders, so be sure to check in with your preferred modular dealer and grab one! Now that the DATA’s 1st run is shipping (thank you so much for waiting 1st run friends!) and the feedback has been good, we are now ready to open ordering for the 2nd run of the DATA. We’ll be starting the 2nd run process immediately, as there’s significant lead times for various elements of production. Our target for shipping the 2nd run units is February 2017. While our 1st run took about 6 months longer than expected, the 2nd run will be much a smoother process. We're going into the 2nd run knowing what to expect, we now have our design perfected, our supply chain worked out, and our production methods proven. Also, a note to retailers: As planned, the 2nd run will include some retail orders. We will be sending out our wholesale ordering information to our list of interested retailers in the next few weeks. So if you’re a shop owner, hang tight for a little bit longer, we’ll be in touch shortly. We’re almost done with the initial draft of the DATA’s User Guide, should have it out next week. We started out writing a “Quick Start Guide” and soon realized that is a ridiculous idea for a module as deep as the DATA; it has now morphed into a full manual. Once the User Guide is up on the site, we’ll be starting on a series of video tutorials, to be posted on our YouTube channel. The DATA 1st run started shipping today! We’ll be sending all orders out over the next couple weeks. Support documents and 2nd run info coming soon! The DATA final assembly is almost complete; feeling good about this week! It’s looking like we’re just a couple weeks from shipping now! The above video is a quick look at our first run of DATA modules being produced at WMD's facility in Denver, Colorado. Yes, WMD manufacturing, in the state of Colorado. We had a slight setback in June when we surprisingly had to switch manufacturers, but now production is in full swing. Last week William at WMD overnighted us a test run of populated DATA circuit boards for approval. We completed assembly on those units and everything checked out great. We should have the full run of populated boards back here in the next week. Also, we’ve been working on the CNC machine, fabricating the run’s worth of display windows and screen mounting brackets. Those wrapped up last week, so we’ll be able to hit the ground running once the SMT populated boards arrive. We’ll be doing the final assembly, QA, and boxing here at Mordax HQ and then we can ship these DATAs out! Lastly, we’ve been getting a lot of inquires regarding the next production run of DATAs. Very soon after we’re shipping the first run we will be opening up orders for the second run. When orders open for the second run we will be sending out notification to the Mordax email list members. Sign up for the email newsletter if you haven’t already and you’ll be the first to know when we’re taking orders for the next batch of DATAs. Exciting times, everything is coming together nicely; it seems we’re on the home stretch now! Last month we received the re-powder coated and silk screened faceplates from American Metal Specialties which did not pass our initial QA (~35% of the order) and now have all the front panels for the run. While the high error rate from the first go was frustrating, we were very impressed with AMS’s commitment to quality and their willingness not only to rectify the errors, but also offer to collaboratively develop a plan for their printers to ensure the next run goes smoothly. In mid-May we received the final revisions of the DATA’s circuit boards and now we are just about through with testing them; everything fits together beautifully and is working as designed! We were waiting for these boards rather anxiously, as there were a number of design changes. Most critical was the display’s 50 pin connector; mechanical tolerances were tight, but as you can see from the image, everything fits together perfectly, with a new edge profile cut that allows the display’s flexible “tail” to wrap around the front control board and meet with its connector on the rear board. We just finished up testing the SD Card sub-system last week and have just a few more tests to complete with the I/O scaling. At this point we’re fairly certain no further PCB revisions will be required before ordering the production’s panelized boards, which we hope to do by the end of next week. We met with Josh and Lars at Darkplace Manufacturing the last week. The meeting was good and it seems there will be no trouble getting the DATA's SMD population completed quickly at their facility. The entire run is estimated to take only a few days to populate with Darkplace’s awesome pick n’ place machine, though it will take a few weeks to get the stencils and PCBs in prior to starting population. We can’t wait to see that machine in action; we’ll try to capture some video to share with you! Lastly, in the previous production update we had mentioned that we did “a bit of feature creeping” on the DATA back in January, which lead to re-visiting the circuitry design, and ultimately to our “extended” production period. We upgraded the power system, added an internal signal routing matrix for run-time calibration, added additional signal scaling, and made a host of other tweaks. But the biggest addition we made was giving the DATA a new digital-to-analog converter (DAC); we replaced the DATA’s original 2 channel 12-bit DAC with a high-end 4 channel 16-bit DAC. So now the DATA is capable of outputting 4 streams of precision CV, or 4 trigger/gate signals, from any of it’s output jacks. We haven’t worked these extras into the current function's code just yet, but as you can imagine, we have plans for all this CV power! Our reasoning behind these additions was to deliver a better product, with more capability and a longer life cycle (e.i., we don’t plan to make a DATA mk2 anytime soon). We hope you’ll agree it’s worth the extra effort and time. Check out the May 2016 issue of Electronic Musician Magazine for a feature on multifunction Eurorack modules. Big thanks to Geary Yelton and the Electronic Musician team for featuring the Mordax DATA alongside a number of other excellent modules! Production of the of DATA is coming along, albeit slowly. A friend who is a veteran embedded systems designer once told us that everything in the world of electronics takes about 5 times longer than expected; I would now have to agree. We received the faceplates from our manufacturing partner a few weeks ago. We QA’d each faceplate at the factory and ended up pulling about 35% of them, mostly due to issues with the application of the black graphics (smudging in the DATA lettering at the top and bubbles in the black around the display window). The pulled plates are now being sanded down, re-powder coated and silk screened; we were told they will be ready for pickup next Tuesday. Despite the high rate of error in the order, the faceplates that did pass QA are excellent, improving upon the original test plates. Specifically, the new plates use a more contrasting grey color in the rings around the buffered through outputs, and the alignment of the Mordax logo green and black graphics at the bottom is much improved. The main hold up though, is PCBs. We couldn’t help ourselves and did a bit of feature creeping back in January, which after the Chinese New Year PCB factory issue in February (noted in our last update), cascaded into a significant delay. After that we ended up needing to do another revision, which we’re hopeful will be the last. We’ll have these boards back soon, then we can test them, and if they are good, move forward with assembly. We’re a month and a half passed our initial target date now, and while such delays are a fairly common scenario in the tech world (I’m looking at you Elon Musk! ), it’s frustrating for everyone involved, especially our supporters. We want to get these out as soon as possible, but even more pressing is our commitment to deliver the best product possible and get it done right. We really appreciate everyone’s patience during our “extended” production period. Thank you! Come stop by the Mordax booth at the SuperBooth16 Berlin event March 31st through April 2nd! Our new target for shipping is by the end of March. When we ship we'll be sending out individual email notifications to those who pre-ordered; shipping will occur sequentially in the order the pre-order reservation was received. Order numbering started at #0100, so if you are order number #0166, your DATA will be the 66th unit produced and sent out. If your shipping address has changed since you placed your pre-order, please send us a message and let us know. Some folks have already contacted us about this; there’s no need to message again if you already have notified us of your new address or other shipping needs and have made note in our log. We spoke with our faceplate manufacturer yesterday and got an update; all of the faceplates have been laser cut now and the powder coat and silkscreen graphics are pending. The estimated time for completion of these is the first or second week of March. Originally we had planned to mount the display brackets (and boards/standoffs) to the faceplates with rivets, but after doing some more manufacturing research we discovered structural adhesives, which are often used in auto manufacturing in the place of welding for metal/metal and plastic/metal bonds. After acquiring all the application equipment, we CNC'd new brackets and conducted the mount tests last month; it has an amazingly strong bond to the powder coated finish, which passed all of our initial testing, including our thermal extreme stress tests (freeze/oven). 3M claims it’s stronger than steel rivets; we’ll have to do some destructive tests soon to see just how far you can push this stuff. Production PCBs are almost ready! One thing that set us back in our timeline was Chinese New Year, for which our board house (based in Shenzhen) was closed for the majority of February; a good lesson for us, now we know to keep informed on the holidays overseas! Luckily, our manufacturing partner in Portland that is handling the SMD population quoted us 2 days for populating the entire run of boards (their machine can place upwards of 30,000 parts per hour, such a crazy device!). Through-hole population and test/inspection is estimated to take a week or two after that. Most of our specialized parts (display screens, MCUs, etc.) have come in, still waiting on a couple more.